Best player that you ever beat in a tournament: If it has to be singles, Armando Ortiz. If doubles counts then my brother and I beat Sean Lenning and Dave Chapman. What are your goals for Houston: Qualify and make the semifinals for the first time. Given the choice, what top pro would you most like to play: I would like to beat Naty Alvarado, so him. Who has inspired you to play this game at such a high level: Players back home. When I was younger I wanted to be able to win our local tournament one day. Luis Cordova Jr is making a spash this season in what some call his “break-out” year. Defeating Andy Nett, Tommy Little and taking Alvarado to a breaker in the process of moving up the ranks, Cordova is setting his sights on the semis and beyond. Amazing power and get ability with superb touch and back wall game has put Cordova at or near the top ten all season long. Luis Cordova, Jr. burst onto the Race 4 Eight tour during the inaugural season, becoming the youngest player to qualify for the prestigious R48 I Player’s Championship. Cordova skipped the entire Race 4 Eight II season due to work commitments but is poised to reestablish himself amongst handball’s elite during the Race 4 Eight III season. Cordova is just 23 years old and still amongst the youngest stars in the game. Born and raised in Juarez, Mexico, Cordova recently relocated with his wife and young son, Luis Mateo, to Pensacola, FL after several months of basic training in Texas for the U.S. Air Force Weapons Systems CV-22. Cordova boasts tournament wins over recent WPH R48 III Plummer finalist Mando Ortiz during the Race 4 Eight I season, as well as a quarterfinal doubles victory against David Chapman and Sean Lenning at his favorite tournament, the WPH/WOR Vegas 3-Wall Ball World Championships. Cordova’s next Race 4 Eight start will come at the R48 III Stop #3 in Houston, TX, January 24-26, 2014. Cordova will aim to qualify for the second time this season after having taken seventh place in the Plummer R48 III Stop #1. Wins over top 16 pros Vic Perez and Aaron Garner at the Plummer Bash announced his reemergence on the pro handball scene. Cordova is a self-confessed handball addict. 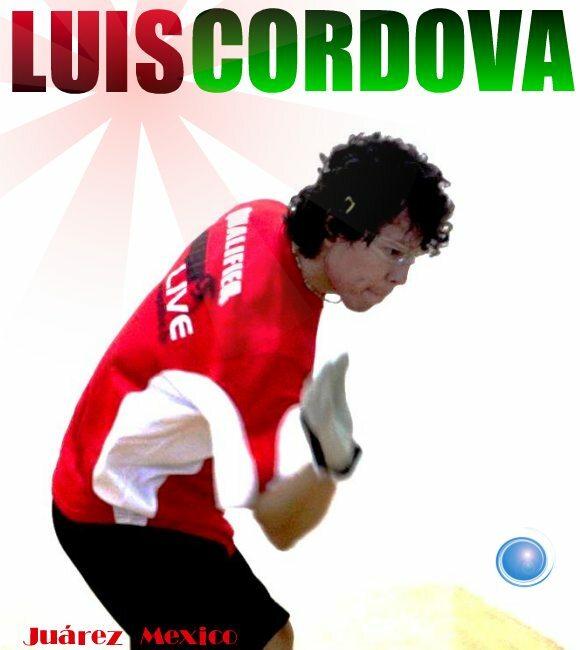 “Just hitting the ball around the court after a long tome of not playing gives me goose bumps.” Cordova has played in WPH 1-Wall, 3-Wall, and 4-Wall small ball and big ball events, as well as playing fronton in Mexico. Cordova is highly proficient in all codes of handball with every type of ball. Cordova possesses the ability to change his game and play several different styles, making him dangerous against any player on the planet. Perhaps the most potent weapon in his arsenal is his devastating right-handed right-corner kill from virtually anywhere on the court. Cordova’s style resembles a young John Robles and his favorite current pro’s style, Sean Lenning. Luis is not the only young superstar in his family. Luis’s younger brother Daniel is a two time collegiate All-American and surefire Race 4 Eight pro in the near future. Follow Luis Cordova and all of your favorite stars on the Race 4 Eight tour by watching all of the live Race 4 Eight webcasts on race4eight.com.